Ramky estates & farms ltd..: Smart Lights- A new Lighting Experience Take your home into the future with the Smart Lights. This set comes with different light panels which you can arrange and rearrange as you wish. The panels are actually filled with LED lights and connect to each other. You can tessellate their triangular shape to best suit your space. You can use the app to choose from different colors. In addition, you can change each panel to be its own color and create wonderful fades and gradations. It’s Even Music for Your Eyes. The Rhythm add-on module transforms music into light. Plug it in, turn it on, and embark on a sensory adventure personalized just for you. The Smart Lights allows you to control the light in your home like never before. 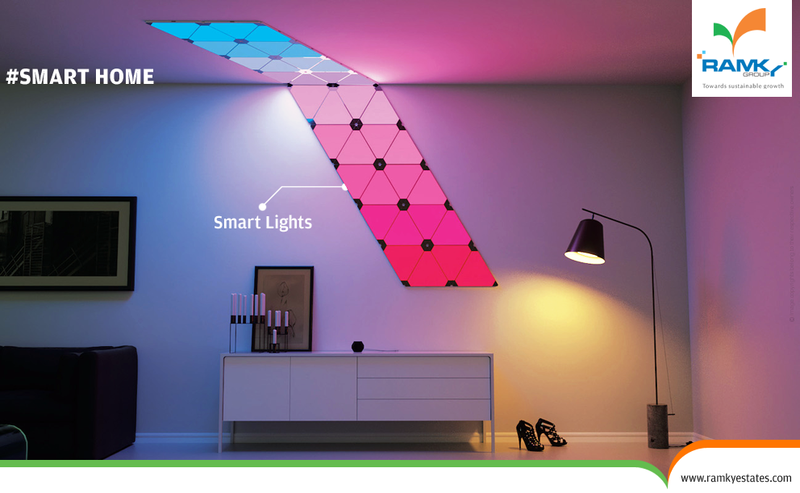 Through your creativity, you can set whatever mood you’d like... Make your #SweetHome, also as #SmartHome with this new Lighting Experience.